How can they do that? One method is with geographic information systems like Esri’s Real-Time GIS. This was the topic at hand during GovLoop’s recent online training, “Agencies Put GIS to Use in Real Time.” Experts included Keith Mann, State and Local Government Industry Manager, Esri, and Deilson Da Silva, Sales Enablement Engineer, Esri. Governments are not totally dissimilar from corporations, he explained, and they can work in comparatively efficient ways. Mann and Da Silva provided a handful of case studies where governments have made use of GIS technology. The county’s IT/GIS system is set up across 64 departments, and each of them uses GIS in one way or another. Pierce County’s cleaning and assessment costs associated with regulation compliance dropped to $60 per catch basin. Using Esri’s Collector software, inspectors here are completing site visits about twice as fast as they did with the old workflow. They attributed this to having data, real-time location, mapping and photo capture in one device. The city’s maintenance team has become much more organized with Esri software. Many of the offices and garages that complete this work don’t normally communicate with each other. Aurora’s GIS team spent 10 minutes training volunteers how to use Survey123, then deployed them into the field to collect data about homelessness. The volunteers were able to collect detailed information about which areas of the city required the most social assistance. PGCLitterTrak facilitates reporting by providing an accurate account of real-time litter collection throughout the county. It also features a map of litter reduction activities. Arizona officials are tracking the progress of disaster mitigation projects. This sort of planning and map analysis lessens the risk of future damage to people or property. Tempe has sought to tackle the opioid epidemic with detailed statistics, like how much Narcan and Naloxone has been given, patient age and day of week. They can also lay out this data on a city map, showing which areas are most vulnerable. This city shares public works information such as road closures, accidents and major events that affect traffic. Waze take the updates and makes route recommendations, cutting down traffic congestion overall. The police department’s Real-Time Crime Center allows it to view what crimes are being reported citywide in an effort to speed up response times. The real-time component was a first for Chicago, but the city has since become increasingly reliant on GIS for special events. Officials have added links to all the city’s cameras for live video feeds, and they’ve expressed an eagerness to add to their real-time awareness. Because it occupies more than 3,200 acres of land with 25 miles of the waterfront, the Port of Long Beach poses a challenge for security. 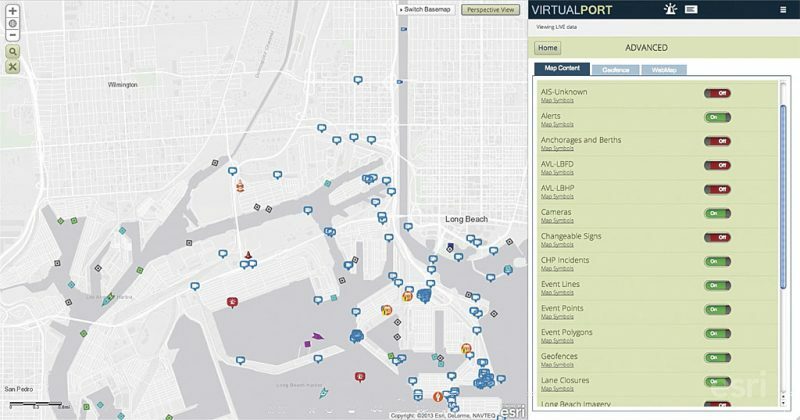 Its Virtual Port provides officials with a clear operational picture of day-to-day security activities. During the online training, Da Silva gave several demonstrations of the software in action, including one in which he assembled mock dashboards for water quality and poverty.